Today we begin to celebrate Halloween! We went to a special Halloween baby music class (Ethan was dressed as a pumpkin, he looked very cute!) 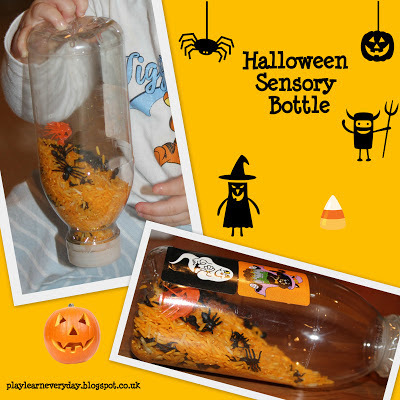 And at home he played with his Halloween Sensory Bottle. We made it with an empty water bottle filled with rice that I had coloured orange (see directions here) along with an assortment of creepy Halloween things. I put in some tiny black spiders and some foil pumpkin decorations that had come off of a Halloween garland. I then glued the lid on as well as taping it to make sure that it was secure. Ethan is too young to play with small toys like this as he may put them in his mouth, so the perfect option is to secure them in a sealed bottle. I also put a few Halloween stickers on the side, just where the bottle was still sticky from the label. Ethan mostly likes to shake his sensory bottle to hear the sounds, we put on some music and he shakes it as he bounces, he is quite musical, so I try to challenge his Creative Development by having him follow a rhythm. I also told him all about the different things inside the bottle and how they're connected to Halloween, working on his listening skills - a big part of Communication, Language and Literacy.